Nothing says that summer is starting from the first day you smell that smoky, rich aroma of BBQ drifting on the air. Immediately, you dig your your BBQ, crack it open, and reveal a rotted out interior, rust, or other inoperable damage. Your heart sinks, now what? Chin up! Now you have an excuse to buy a new grill! The first thing you need to consider when shopping for BBQ grills, smokers or BBQ pits for sale is timing. While readily available most of the summer, the start of the season is when you'll see the least savings. Many people only start considering a new grill purchase when they discover that theirs has failed, and this usually happens early in the spring. Because of this, there's a rush on the stores as new models are rolled out and there won't be a sale in sight. Instead, the best time to buy is actually closer to the end of the season. Sales are abundant in late July and August since stores don't want to have to warehouse the grills over the winter months. By the time Labor Day rolls around, most of them will be gone. Where you shop will also make a huge difference in what types of grills you get to see and what prices they'll be selling it. Large department and hardware stores like Home Depot will have lots of options, but they will most often be gas or electric, with a lesser stock in charcoal. While affordable, you will sometimes overpay for heavily marketed items at these stores. Specialty sellers who custom make BBQ pits, offset smokers, and the like, will also be offering sales, but not to the dramatic discount you will see at big box stores. These are specialty shops that have less of a profit margin. Finally, consider what type of grill you want to invest in, what fuel source you want to use, and what features you need. It can be hard to make an educated decision when you're at a store with a salesman following you around. So make a list, and stick to it! The world of grills is wide and plentiful. You can find just about any type of feature of style you could hope for, but sometimes it can be hard to sift through the glut of information and features on each grill to find out if you're buying what you actually need, or what is just fake hype. To prevent this, we think it's important to go back to the basics and start with what the grill cooks with. No matter what bells and whistles your grills has, their source of fuel will determine the most about how your grill behaves, how it cooks, and what kind of upkeep it will require. While there are some luxury grills that can do double (or even triple) duty, most common grills will rely on only one source of fuel to cook meat. That being said, these grills are very different. Here are some of the differences you will encounter when working with different fuel sources. Gas grills are perfect for backyard chefs who want to get dinner on the table fast. 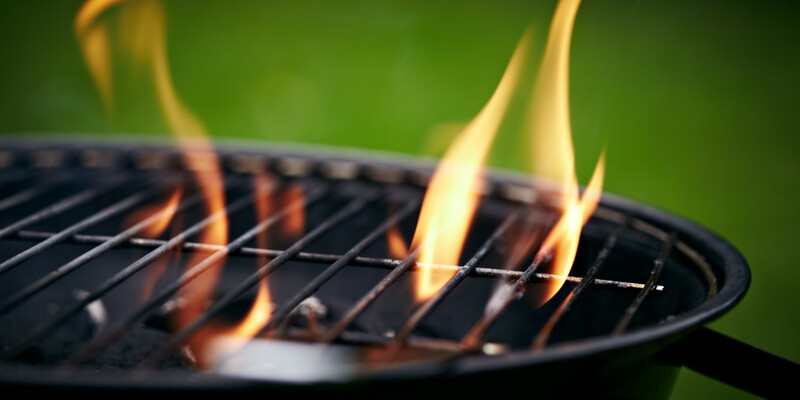 Gas grills heat up quickly and require little to no cleanup. But what you get in speed, you lose in flavor and in price. Gas grills struggle to imbue any smokey flavor into the meat, even those gas grills with smoker boxes fail to even touch the flavor a charcoal or wood fired grill would give you. Gas grills are also surprisingly pricey, even the more affordable brands will run you significantly more than any charcoal version. If you're a BBQ purist, you will love nothing more than a charcoal grill. Charcoal imbues meat with the deep, smoky flavor of true, traditional barbecue. Charcoal burns at a higher temperature than gas, which allows you to easily sear the meat before lowering the heat to an easy temperature for long grilling. You know that awesome offset smoker you may have spotted on the grilling circuit? They use charcoal too. That should be more than enough street cred. The downside of charcoal? The time. Cooking with charcoal is time intensive. It can take up to 45 minutes for a charcoal grill to start the charcoal and pre-heat the grill. You will also need to spend more time cleaning it up and charcoal is significantly more expensive than wood. If you don't have acres of open country or you live with prohibitive city regulations, using an electric grill will allow you to cook your meat without fear of the neighbors calling the city. The downside? Taste. Electric grills may produce similar looking meat to their charcoal-powered cousins, but you'll quickly notice the difference when you take a bite. Most grills don't actually heat with logs anymore (barring the grillmasters of the South with their massive rigs), but with pellets. Grilling with wood pellets as your fuel source will probably give you the best, most natural, smoky flavor you'll ever taste on meat. Wood smoked meat has a deep, rich flavor that simply can't be replicated. That being said, it does suffer from some of the same issues as charcoal grills. It takes significantly longer to get the grill prepped and it will take longer to actually cook the meat as well. It may also be more expensive, depending on where you live. If you're looking at purchasing a new BBQ pit or grill for the upcoming grilling season, you're not alone. In 2016, 46% of Americans polled by Hearth, Patio and BBQ Association were looking to purchase a new grill or smoker in the next 12 months. This isn't really a surprise to us since grilling is one of the great American past-times. From New Jersey to California to Alabama, every part of the United States has their own version of the "best" BBQ and the "best" way of doing it. We're not here to debate who has the most scrumptious BBQ, but we will throw our hat into the ring for one of the best ways to do it. Here are 3 reasons we think BBQ pits are the bee's knees when it comes to grilling meat to perfection. You can find a BBQ pit to do just about anything you need it to do, from grilling chicken to smoking some mouth-watering brisket, to making pizzas and roasting veggies, you'll find that a BBQ pit allows you the versatility to cook and cater for large groups of tastes and ages. Proper BBQ means time. The low and slow method of grilling meat until it's melt-in-your-mouth, fall-off-the-bone goodness means that you will have to keep it going for hours over a steady bed of coals. This means that you will be forced to have some downtime where you can catch up with friends and family, put work aside, and just sit back and watch the clouds pass. While you can certainly get a smoker or BBQ with loads of bells and whistles, a traditional BBQ pit is a rugged affair. Made of steel and using charcoal or wood as a cooking method, these devices have very little that can go wrong on them and are made to survive the test of time. With a little cleaning and care, you can expect to enjoy your BBQ pit for years to come.